Animal Training: Can You Do It? Training animals is not easy but if you really like it, you will find a way. If you want to train your dog, there are many things that you should consider. Though there are no true national certifications here in Singapore (unlike in other countries like the U.S. which has certification council for pet dog trainers), you can still learn the art. But you need hours and hours of training and credits to maintain or keep the certification. Read Books: It is important that you gather books or reading materials about dog training or animal behaviour in general. You can research online or go to bookstores and find books about animal behaviour. Learn the Profession: You should learn about the profession. This also involves a lot of reading. These books will bring you to the world of animal training. You can also research online or simply go to bookstores. Volunteer: If you really want to observe the dogs, it is advisable that you volunteer at local dog shelters. Volunteering will help you survey and study dogs. This is good because you can encounter many types of dogs. 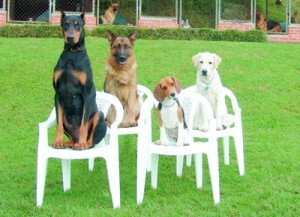 Visit Dog Training Classes: If you hear about dog training classes nearby, you should go there. You should be interested in science based techniques like reinforcements or commonly called conditioning. You will see actual dog training. If you are seriously considering pet training, you should do your best to understand your dog. Understanding the behaviour of your dogs can make a difference.